A quick overview of the Exchange Management Console, or EMC; a very capable management console accessed via the OWA web interface. My first instinct when I receive a message like this is to check services. Yes, as I suspected, upon viewing my primary Exchange server services, the Microsoft Exchange Server Information Store Service was not started. I started the service manually, logged into OWA again, and found I could now completely log in and see my OWA inbox. Now that you’ve clicked into all of the options, you will want to change the Mail > Options: “Manage Myself” drop-down to “My Organization”. You are now in the Exchange Management Console. 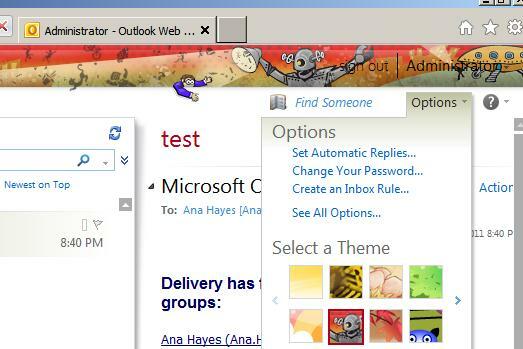 Take note that Multi Mailbox Search (which is under mail control in RTM). RVAC, even the admin is not able to see the Multi Mailbox Search; you have the add the administrator into the Discovery Management Role Group. 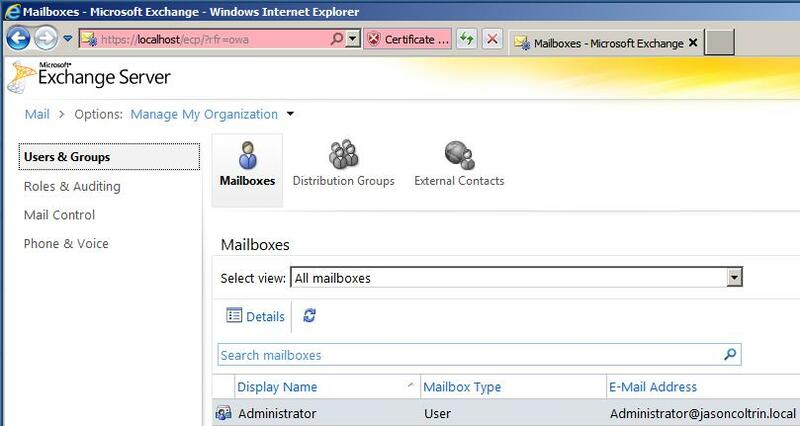 Once added to that group, you will see MultiMailbox search in the Administrators EMC. * Then we’ll look at the purpose of PowerShell and the EMS, focusing on how commands are formed using cmdlets and how they are made more complex and useful through pipe-lining. The EMC is based on MS MMC 3.0 and the GUI version used for Exchange. Under Server Configuration, when you click on Mailbox, Client Access or Hub Transport, you’ll notice that there are two middle panes. A results pane and a work pane. The Actions pane can be turned off by clicking Show/Hide the action pane button on the toolbar. When you turn it off, you can still perform functions by right-clicking on objects. One thing to note in the Console Tree is that you have by default the “Microsoft Exchange on-Premises.” It is designed so that you can manage Exchange Servers in the cloud. The Exchange Management Shell is a requirement for Exchange Administrators (and there are questions about it in exams). Learning PowerShell is not an option, it is a necessity. PS is both a command-line tool and a scripting platform. Exchange 2010 requires PowerShell v2. The EMC allows you to make configuration changes to the Organization or to individual Servers. In Exchange 2007, you could only run the POwerShell compone3nts on the local machine. 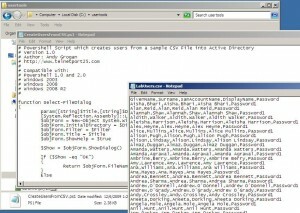 With Exchange 2010 you can connect to a remote session on a remote Exchange 2010 system. Get-Mailbox | Set-Mailbox -prohibitsendquota 500MB (this will take every mailbox in the organzation and set the prohibit send quota to 500MB – manually would take forever! The Exchange Management Shell contains modules we need. You can import them into PowerShell, but the EMS already is loaded. 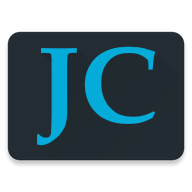 >get-excommand – quite a number of different cmdlets! To investigate how to use one of these commands? >Get-Mailbox -> shows all the mailboxes on the server – names, where they reside, quota. 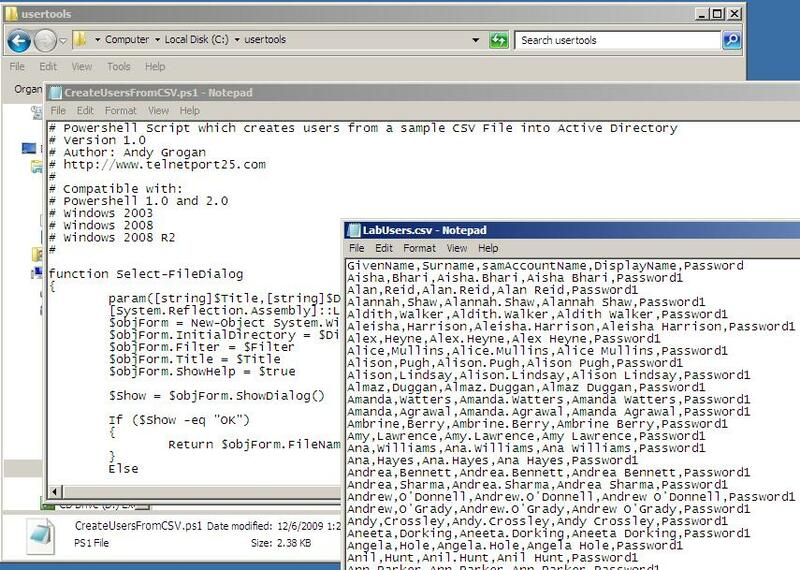 Andy Grogan created a script to create (fake) users on a domain. You can create several hundred users. Go to UserTools, and you can see a .csv file which contains basic info for creating users. You can change these, and use your real names and create an entire domain of your users. Run the powershell script within powershell, and you should see the users scroll down the screen as they are created. Now that the users have been created, go to your Mailbox server and go to Organization Configuration -> Mailbox -> “MailboxDatabase” is the database where we will be placing our new users. We will use the ExchangeUsers OU to help build mailboxes for our lab users. Under Recipient Configuration, we do not yet have users listed. We do not have mailboxes for them. Now that your users have been given mailboxes, goto OWA at https://yourdomain/owa , log in as one of the users and test sending/receiving to the administrator.